**New series reissuing and reappraising classic funk, jazz and soul from a Hip Hop/House head's perspective. 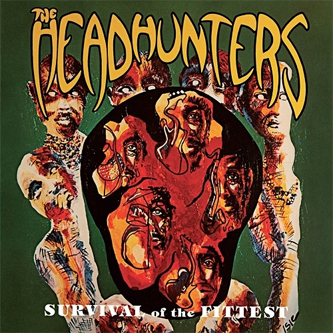 Digitally re-mastered from original ¼" tapes** R2's reissue series kicks off with a double CD set of The Headhunters' 'Survival Of The Fittest' and 'Straight From The Gate'. The former, recorded in 1975, is their first side without Herbie Hancock (they'd previously laid down an eponymous best-seller with him) and features a psyched fusion of Jazz, Funk and studio trickery including the Pointer Sisters on standout cut 'God Made Me Funky'. Their 1979 follow-up is a more accessible combination of Jazz, Funk and Rock which provided much inspiration to the Hip Hop scene, most notably by Q-Tip on Mobb Deep's 'Drink The Pain Away'.